It is my tradition to hike somewhere unfamiliar for my birthday, which occurs around Memorial Day each year. 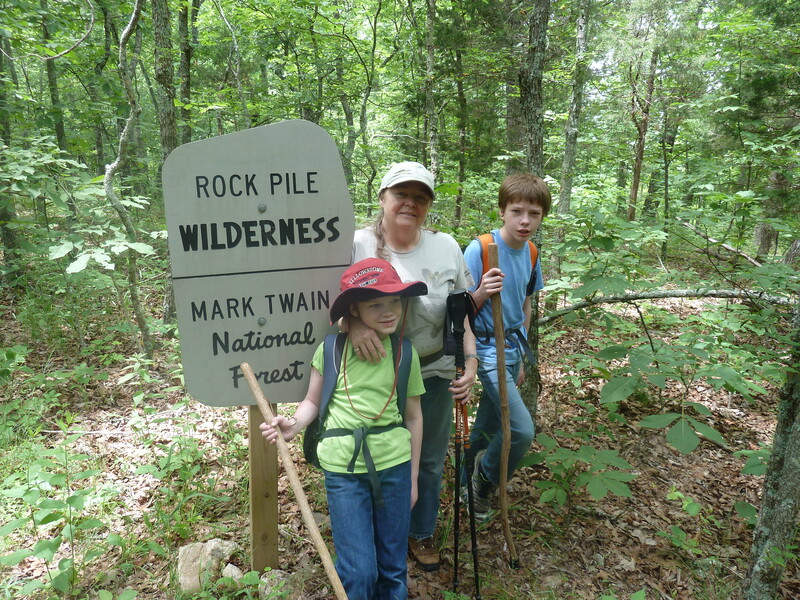 This year being my 60th, we came up with something “special”, an idea to hike in Rockpile Mountain Wilderness, which is actually in Madison County, where we live. Even though I have been here 25 years and my husband 40 years, we had never gone there. In trying to find some information about the place, we found that there is very little, by way of written reviews or photographs to prepare for such an experience. We were fortunate to discover a book copyrighted in 1999, “Unspoiled Beauty – A Personal Guide to Missouri Wilderness” by Charles J Farmer. Therefore, we assume he must have visited the area sometime in the 1990s. Mr Farmer’s book was VERY helpful to our experience; and at the same time, we did not entirely have the same responses to the area that he did. Therefore, I would like to add our experience of the place, for anyone who might be inclined to visit the area in the future. It is definitely worth however much time you might have to give your own explorations. We found Mr Farmer’s directions helpful but not completely accurate. One encounters Madison County Road C just off of Highway 67, south of the gas station stop known as Cherokee Pass at A Highway (which leads to Marquand). Mr Farmer had stated it was 10 miles to County Road 406 but we encountered that road at approximately 3-4 miles. Thankfully, we have GPS and could determine that there was not another entry for County Road 406 further down Highway C. Next, I would like to point out that the marker for Forest Road 2124 is simply a brown wooden post, about the height of what one would use for a rural mailbox, with numbers applied like one would put at their home to identify it’s location. Fortunately, at least it is clearly marked. There is a nice viewpoint on County Road 406, where my husband did remember an acquaintance taking him 40 years earlier, but being new in the area, he didn’t truly know where he actually was at the time but as we came upon it, he said “I’ve been here before ! !”, though he had not been to the Rockpile Mountain Wilderness before. 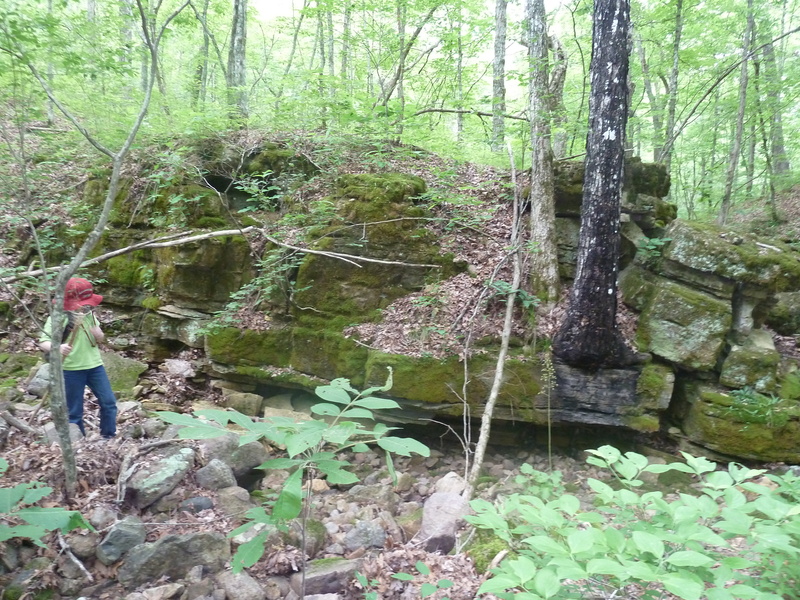 There is a large outcropping of glade-like rock at that point. The forest road is a bit rough. We have a Volvo Cross-country Stationwagon. Any good utility vehicle would do fine but an urban intended low to the ground car would have great difficulty getting there. The trailhead is well marked with a bulletin board complete with all kinds of warnings, a modest amount of information about the area and a registration or sign-in form, so something is known about who visits, their intentions and for how long they do expect to be there. 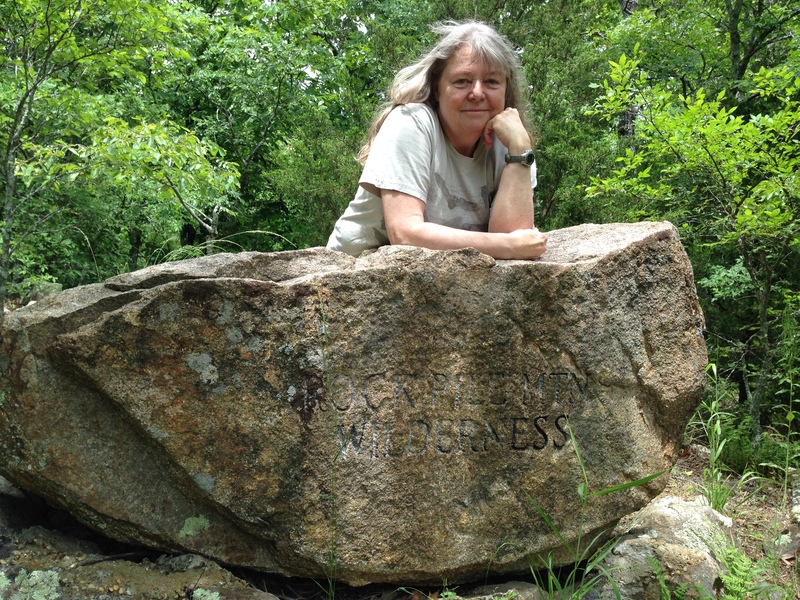 The large granite marker remains at the trailhead with the carved words “ROCKPILE MTN WILDERNESS”, though the carving has faded somewhat over time. Our neighbor who is with the volunteer fire department warned us that people get lost and have to be rescued from there every year. He also expected that we would encounter a lot of blow-down from storms due to the Derecho of 2009 that did great damage clear across the width of our state of Missouri. Fortunately, I can state the damage was not so bad that it impacted our enjoyment of the wilderness there, but it was noticeable and in places does obscure the forward path of the trail but “walk-arounds” have been created by visitors at every point. 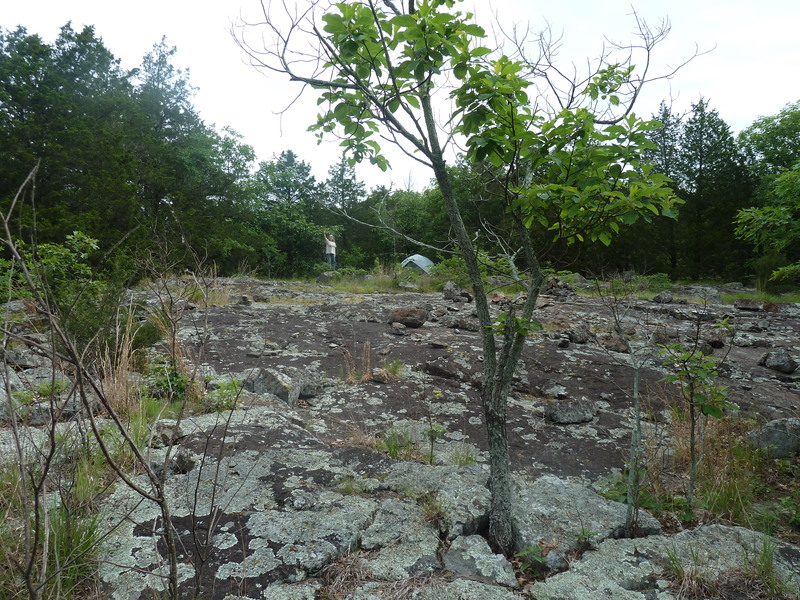 For scale, at this large glade, I am standing on top of a large rock with our tent to the right. Mr Farmer had planted the seeds in my family to do likewise. 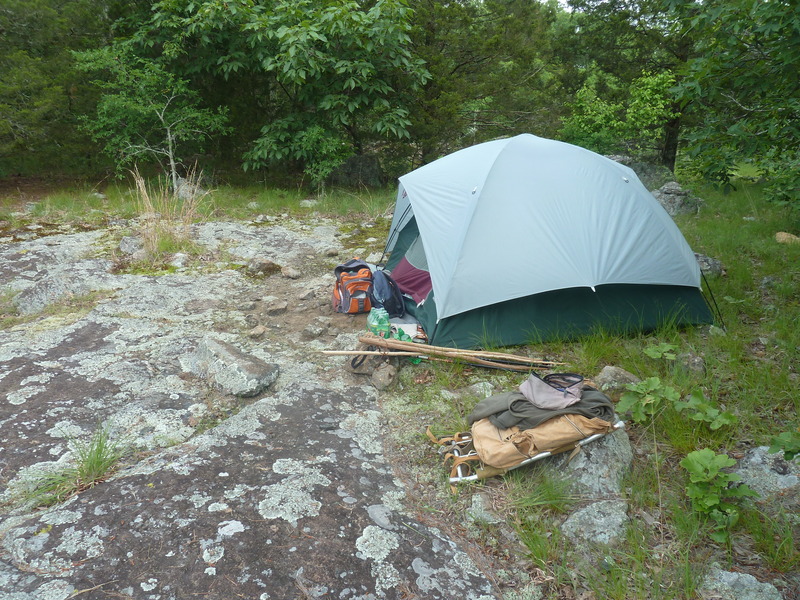 However, having now spent two days in the wilderness there, we disagree and say that the ultimate camp in Rockpile is the large glade at the top of Rockpile Mountain within site of the ancient stone circle. That place is magical with rock, moss, grass and a big open view of the night sky. There was no litter there, which Mr Farmer and earlier visitors had lamented about, before the area was designated wilderness and perhaps shortly thereafter; but there were two major firepits pre-existing in that place, which we saw during our time there. One fire ring was right in the center of the large glade, and one just off from there, on a smaller, more secluded, glade. 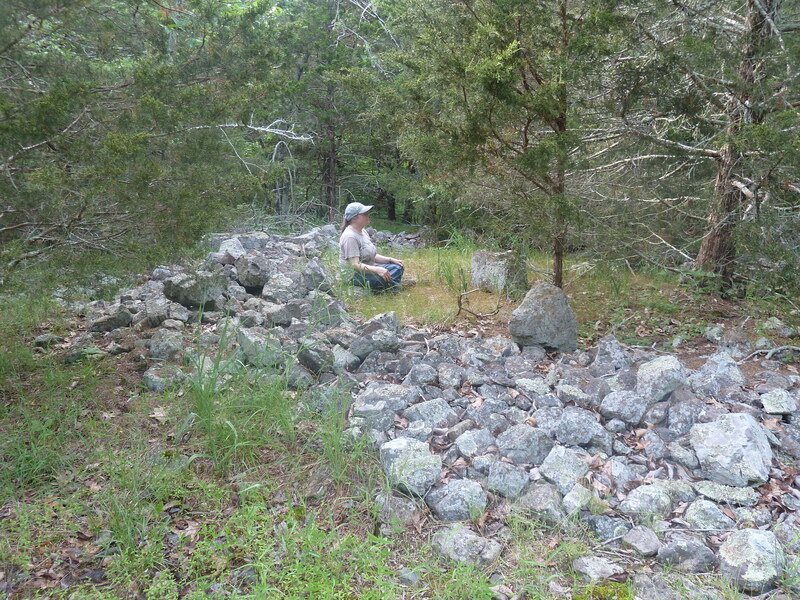 I am seated facing the firepit with the large cairn behind me. We started our hike about 1pm in late May 2014, just after the Memorial Day weekend. Each of us had walking sticks and I would say having them is NOT optional. It is VERY rugged terrain and the trail, while well-worn goes immediately down a very steep hillside. There were orange survey/flagging ribbons tied on trees along the trail, which made identifying the trail easier, especially at blow-down areas where walking around the debris was necessary. However, we did not know who or why the ribbons were there and had no certainty what they indicated or for how long in the direction we wanted to travel they would continue. The reader is to keep in mind the temporary nature of such markings, as these tend to degrade rather quickly over a few years time. Indeed, early on the trail, a couple of the ribbons that had been around large trees, had fallen to the ground. But if the ribbons are still there on the trees along the trail, they will most likely take you all the way to the ancient stone circle. Based on our experience, you may feel more assured than we did, of that much. We came upon a clearly man-made water catchment pond with some pond vegetation, small lily pads and tall spikes of vegetation which included the joy of seeing many frogs and toads leap into the water at our approach. 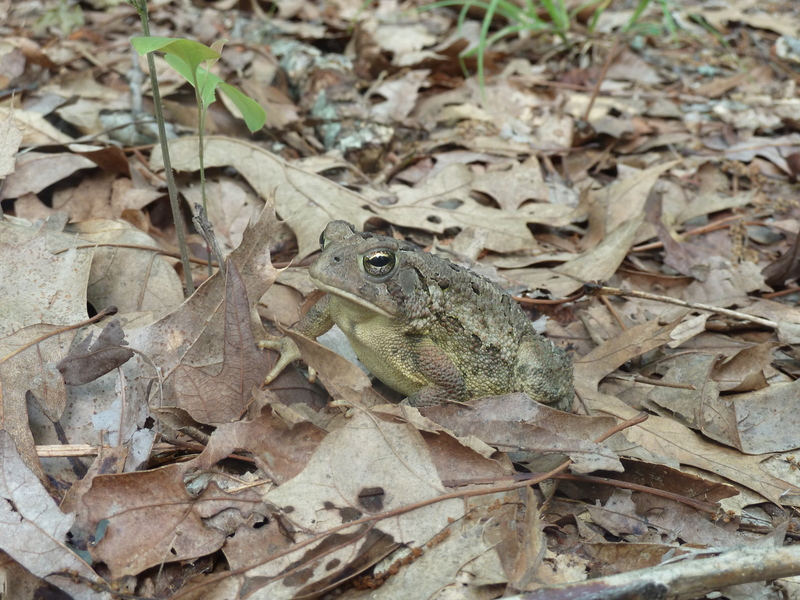 We saw toads along the trail at 3 different times during our visit. We had pepper spray with us because we had been warned of the possibility of wild hogs and we also hoped that it might be helpful if we encountered poisonous snakes such as copperheads or timber rattlers but we didn’t even encounter squirrels. 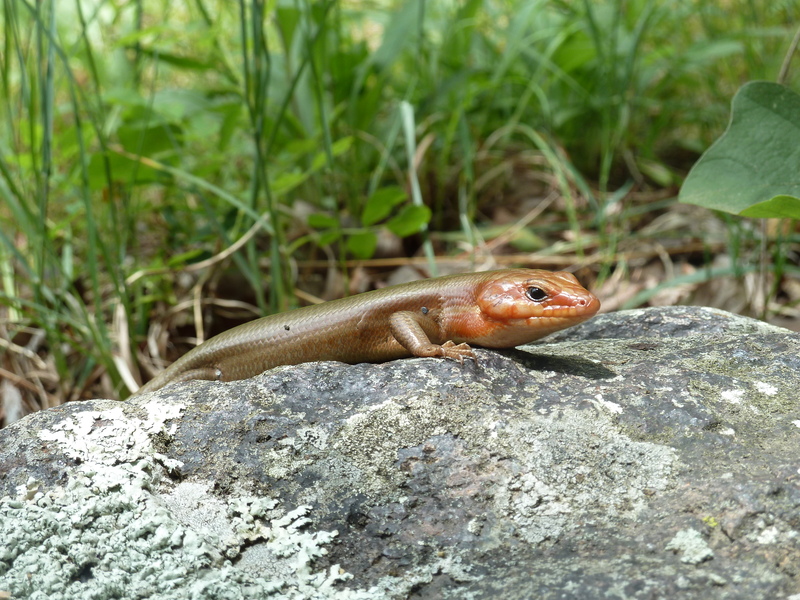 My older son did photograph a red broad-headed skink at the beginning of our trail. 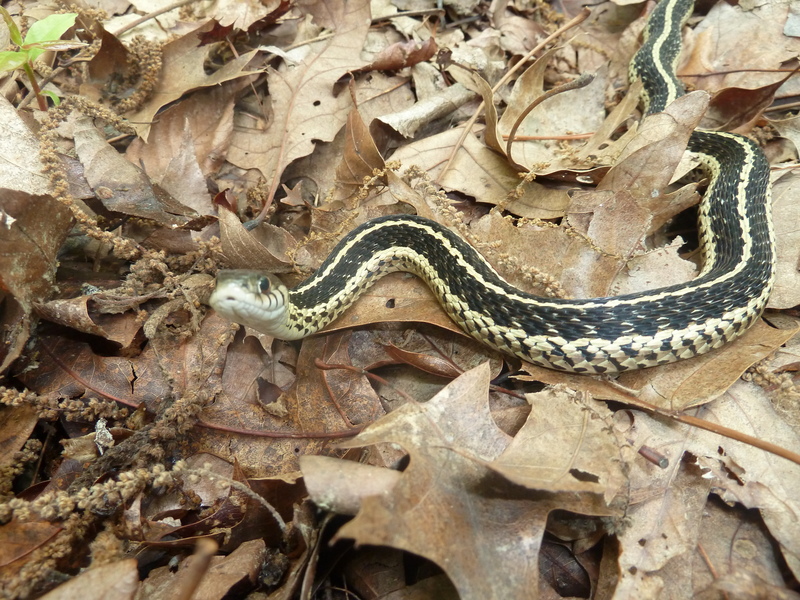 Later, we encountered a beautiful garter snake. This was the extent of wildlife that we encountered, though there was a lot of bird song always. 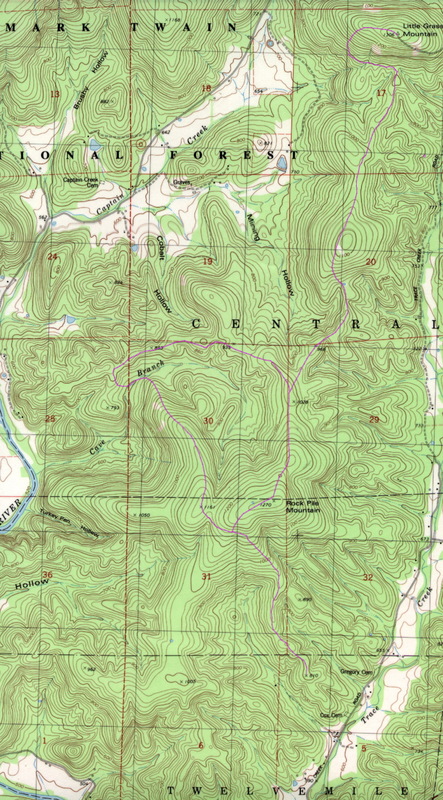 A GPS and good map are critical as well. Since we lacked certainty about the nature of the orange ribbon markers and as they did diminish to be less frequent the deeper in one traveled, at one place where the blow down confused the trail, we did begin to follow an old logging or local road that was disappearing back into the forest but which had a well worn foot path alongside or within it. Fortunately, we checked our bearings and quickly discovered we were no longer heading in the direction of the stone circle and backtracked to a point on the trail that we were certain of. So, the presence of a trail in this wilderness may only mean you are not the first to mistakenly go in that direction. We began to see some rock cairns; and then glades and large boulders, and were walking along the obvious crest of the mountain. We paused for a break and discovered that we had actually arrived at the ancient site. It was already going on 6pm by that time. Including our mistaken journey along the wrong path, it had taken 5 hours of mostly continuous hiking to arrive there. Thankfully, we decided it was too late to head down to the river and camped right there. The stone circle could be underwhelming but it is clearly ancient. The sheer volume of smallish rocks piled deliberately to create a circle or squarish enclosure is unmistakably the work of people without the modern technology to move heavier rocks further. Some of this enclosure seems to have collapsed or spread out over time. There are a couple of smallish cedar trees growing in the circle and the squarish center rock described in Mr Farmer’s book. After our return from the area, my husband and I theorized about the area. Could it have been a seasonal hunting camp ? The big glade would have made a nice and less buggy work area but we have rejected that possibility because there really isn’t any water convenient to that location. We are left with the sense that it served some kind of spiritual purpose. Twice, I spent time sitting in the middle of the circle facing the squarish rock at the center. I felt a deep sense of well-being while sitting there. It was not a gee whiz, fireworks or visions, type of experience. It was a quiet, subtle feeling of simply wanting to remain seated there, of time not seeming to pass, of an aliveness to that place that provoked deep feelings of peace, calm and an emptiness of thought. 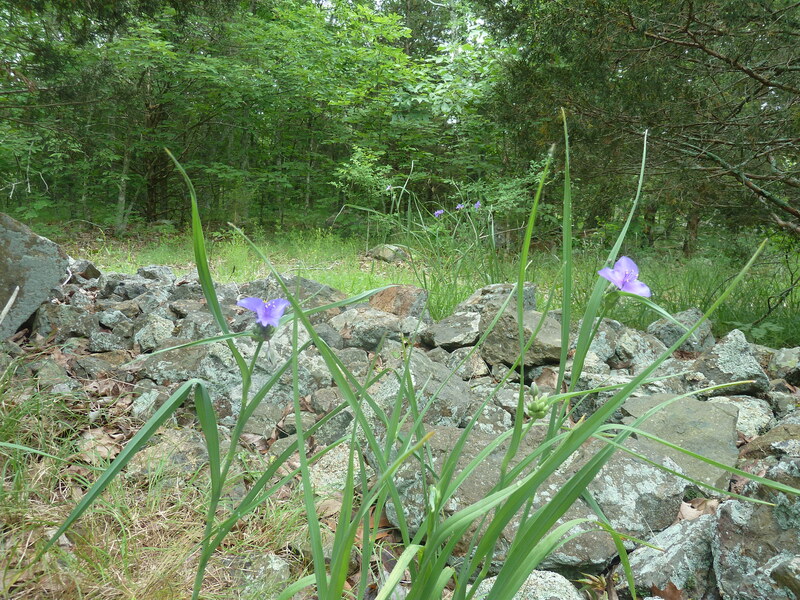 The night we arrived, there were within the ancient stone circle, numerous wildflowers standing on tall stalks with buds, that I did not immediately recognize as the Spiderwort, that these proved to be when I returned there the next day with my morning’s cold instant coffee, to “wake up” while sitting in the circle there. I was awed and kept exclaiming “oh, oh, oh” at the sight the flowers, for all of the plants in the circle and immediately adjacent to it had bloomed overnight. 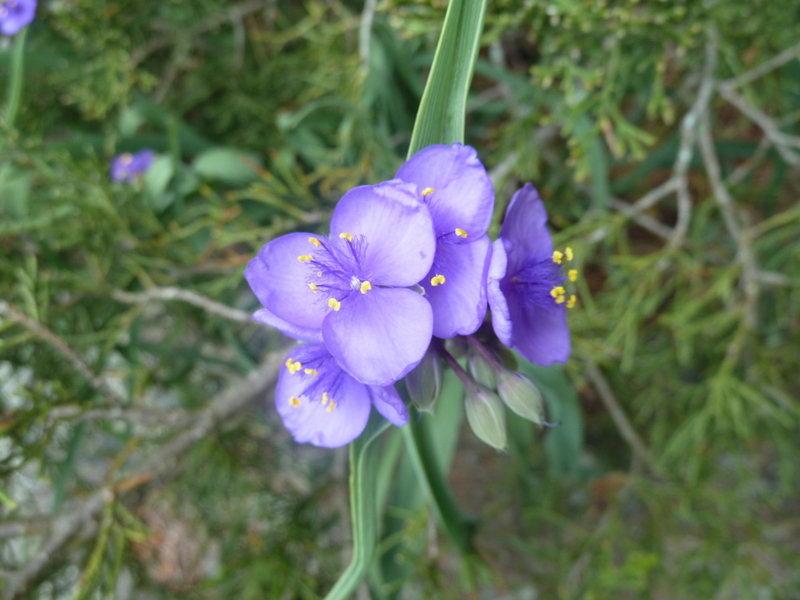 I had never seen Spiderwort so tall, as our own grows in forested places close to the ground. Campsite between large glade and ancient stone circle. We noted that there was something about the place that just makes people want to pile up rocks. 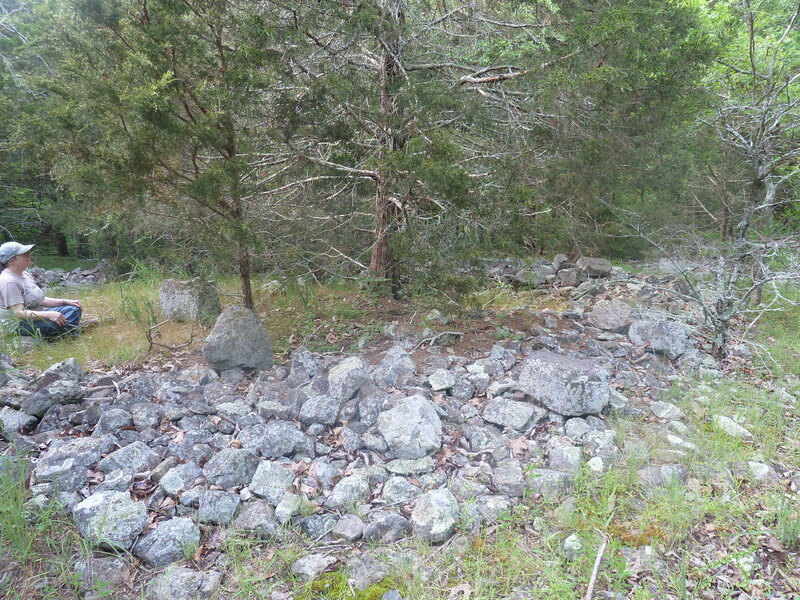 There were numerous little cairns along the trail and just off the trail at various places in the wooded area. Mr Farmer notes the “effect” that being there had on him. “. . . I had . . . a strong sense of power from the modern circle, I felt wonderfully at ease reclining on the smooth slab of granite just outside the circle of rocks. Afterward, I thought it strange that I did not immediately rush in all directions trying to find the authentic rocks.” In fact, he goes on to note that he actually – “. . . dozed there for about forty-five minutes and then quickly rose to my feet as though awakened by an alarm. . . . I ran smack into the real circle of ancient rocks just south of the trail . . .” (deb’s note – still true to the actual location) “I had actually walked within three feet of the spot on two occasions without knowing it.” It is right ON the trail, but to the south of it, so at this time, one following the trail would not fail to find it right there. The next day, after breaking camp, we did determine to get down to the St Francis River via Cave Branch. We saw two “markers” – both diamond pieces of metal. One was on a forest service type post with the hand written words along with an arrow for direction “stone circle”. The other on a tree downhill to the west from there along an old logging or local road that remained visible. However, we did not have that luxury of road or trail for very long. Thanks to GPS we made our way towards Cave Branch and encountered it after about an hour of hiking. I would strongly recommend Oct-April for hiking this wilderness. There was no avoiding the poison ivy everywhere we attempted to hike. There was a significant amount of greenbriar around but it is mostly easy to avoid. It is very rocky and rough and steep. The walking sticks were crucial not to tumble or stumble there. Cave Branch is worth visiting. It is magical and beautiful. It was dry when we were there until close to the river. We were grateful for it made hiking easier for the most part. I could imagine it running with Spring run-off and being very exciting to behold. There were some grandfather Sycamores growing there as well. However, close to the river we encountered a “Private Property, Trespassers will be prosecuted” sign on the south side of Cave Branch, so we stayed to the north side. There we ran into stinging nettles along with poison ivy, greenbriar and dense vegetation. Arriving at the river was underwhelming for my family. The bluff that Mr Farmer had so prized was barely visible in the fully leafed trees and no caves could be seen. I don’t think we ever even tried to locate Turkey Pen Hollow, so I can’t really say if that is worthwhile or not. I suspect it is actually on private property. The St Francis River was wide and dirty brown, not all that exciting when we arrived there after noon. We went upstream a short way to an elevated gravel bar with shade and had lunch. Following along a dry high water channel parallel to the river, we passed some ancient and beautiful Cottonwood trees. I’m not used to seeing them here in Missouri, I grew up with them along the currently “dry” Rio Grande River in my childhood (1960s-1970s). Getting back uphill from the river was not the most fun part of our hike. It was difficult, bushwacking the vegetation at the beginning and very steep climbs up. We came rather soon upon a bit of barbed wire fence that we were able to cross with the aid of a tree branch that had collapsed the fence, at one spot. Just past that, we encountered a flat metal post that announced “wilderness” and forbade motorized vehicle traffic beyond it. That led us to believe that at some point along Cave Branch, we had actually left the park and entered private property unintentionally. 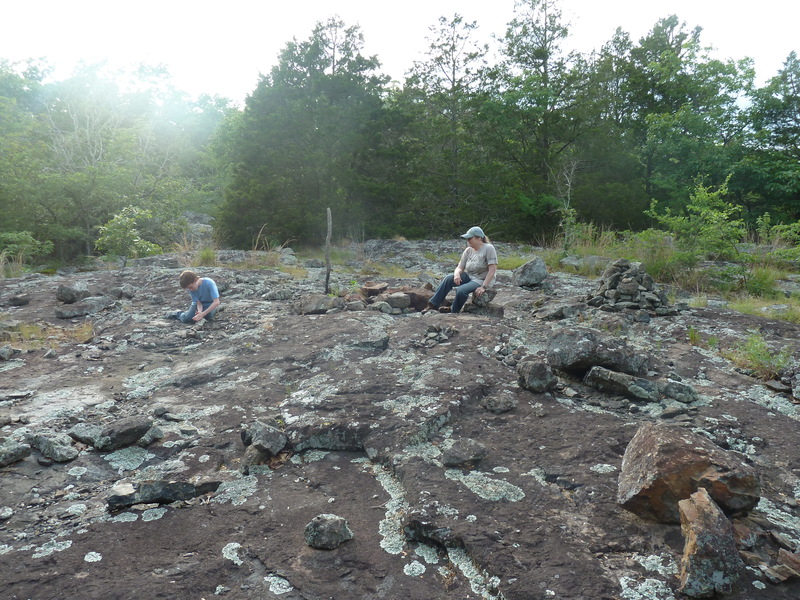 There were at least two land features, a large bald knob and a very large rock outcropping on the way uphill that would be worth revisiting when the vegetation is diminished in the colder seasons. I’m certain there might be some amazing views that time of year. I would never recommend to anyone that they chose the river to camp overnight at. We passed another man made catchment basin that seemed a bit less active with amphibians. We eventually made our way to the remnants of an old logging or local road that still shows up on GPS mapping. We followed that back to a T junction of the ribboned trail, where one passes between two ribbons marking that junction. We were well worn out, so the climb back up to the trailhead was long, slow and difficult; but the experience of being in Rockpile Mountain Wilderness was definitely well-worth my time spent there. You are currently browsing the archives for the Wilderness category.